VR And The Human Brain: Are We Ready For This Old Technology Yet? VR has been around since the seventies for research, medical and military applications. The democratisation of VR technology that happened in the last few years brought us face-to-face with a rather strange challenge: It often appears that our physiology is standing in the way of allowing us to experience this immersive platform to its full potential. Do we accept that VR is not for everybody or there is something that can be done? 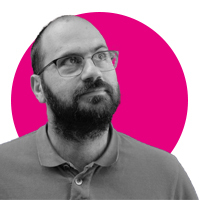 Currently director of Riot CGI, Balampanos has worked on many interesting projects for Adidas, Corien, the NHS, Silver Cross and many others. Previously he taught CGI for 7 years at the University of Huddersfield.